To slope means ‘to have an inclined or oblique direction or angle’ and also ‘to move at such inclination.’ To form something with such an inclination is also to slope. As a noun, a slope is ground that has a natural inclination, like the sides of a hill. It is also the inclination itself or any other inclined surface. The ground sloped gently away towards the valley. It was late afternoon and already the sun was beginning to slope to the west. The sides of the excavation had been sloped. The hikers made their way up the slope. The river flows fast at this point, due to the slope of its bed. The slope of the writing desk makes it more comfortable to write on. In mathematics, slope is the direction and steepness of a line on a graph. You can read more about the mathematical meaning of slope here. 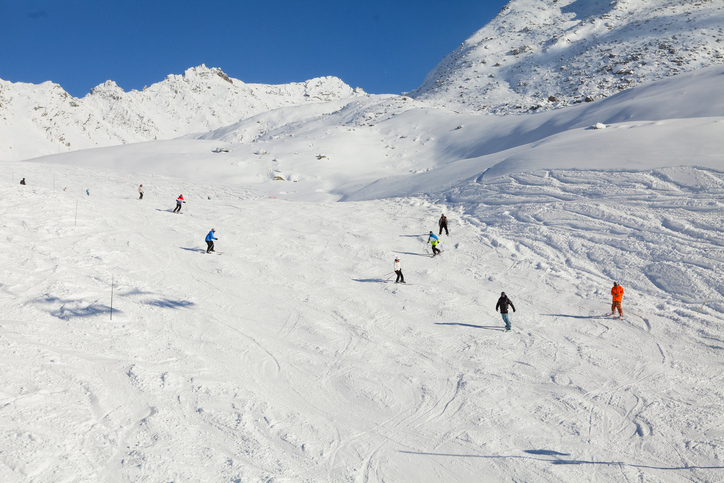 Slope has been used as a verb meaning ‘to go in an oblique direction’ since the late 16th century. It evolved from the earlier adverbial (and possibly adjectival) use of slope, around the year 1500, meaning ‘slantingly’ (or ‘slanting,’ as an adjective) which was, in turn, a shortened form of the Middle English adjective and adverb aslope, with the same meaning, which some think happened because of its similarity to the existing verb lope (to leap, jump, or run with long strides). It can be traced back to the Old English adjective and adverb aslopen, which originated as the past participle of aslupan (to slip away). It can be traced back to the Proto-Indo-European root sleubh– (to slide or slip), from the root (s)lei- (slimy, slippery or sticky). It is related to many other words in English, including slip, slipper, slime and sleeve, as well as Germanic words of similar meanings, such as the Middle Low German slippen, the Old High German slifan, the Middle Dutch slippen and the German schleifen (all meaning ‘to glide or slide’). The meaning ‘to place in a slanting position’ is from around the year 1600, but the intransitive sense, ‘to be in a slanting position,’ appeared in the early 18th century. The noun, meaning ‘inclination,’ comes from the verb, and dates back to the early 17th century. The meaning ‘an incline or slant,’ usually of the ground, appeared soon after.